Public safety and law enforcement officers from over 30 agencies processed into St. Patrick Church in Washington, DC, today for the 16th Annual Blue Mass, to honor and remember officers killed in the line of duty. Blue Mass began in 1934, when police officers gathered to pray for their fallen comrades and seek God's blessing for their own safety. The tradition stopped in the mid-1970s, but has resumed in grander fashion than ever. 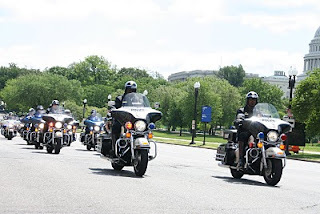 The name "Blue Mass" comes from the traditional color of many officers' uniforms. The principal celebrant and homilist for the Blue Mass was Archbishop Donald W. Wuerl of Washington. As a special honor this year, Lynn Lyons-Wynne, the NLEOMF's Senior Director of Memorial Programs, was invited to do a reading. 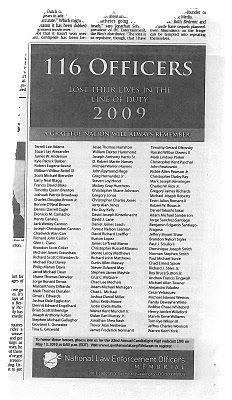 In 2009, 116 officers nationwide died in the line of duty, including six federal officers and three officers from Virginia who were remembered during today's Blue Mass. From the beginning, the service and sacrifice of America's corrections officers have been an integral part of the National Law Enforcement Officers Memorial. Today, 565 corrections professionals who made the ultimate sacrifice are remembered on the Memorial walls. To honor these heroes, the Metropolitan Washington Council of Governments hosted the 19th Annual Corrections Officers Wreath Laying Ceremony and Honor Guard Competition on Saturday, May 1, at the Memorial grounds. The ceremony helped to kick off National Correctional Officers and Employees Week, which runs immediately before National Police Week, from May 2-8. Following the wreath laying ceremony, honor guard units from corrections departments in DC, Maryland and Virigina competed, with the U.S. Coast Guard serving as judges. Craig W. Floyd, Chairman & CEO of the Memorial Fund, was the guest speaker at the ceremony. He somberly read a roll call of corrections officers who recently died in the performance of duty, while officers marched to the center medallion and placed a single rose there. After each name was read, a bell chimed, and at the end of the roll call, white doves were released into the skies above the Memorial as a symbolic tribute to the fallen heroes. "Today, the words inscribed on this Memorial ring out, “In valor there is hope.” As long as there are men and women among us willing to put their lives at risk for the safety and security of others, there is indeed great hope for the future of this nation, and the future of our children. May God bless all of our nation’s corrections professionals for what they do each and every day to keep America safe."